Discussion in 'General Discussion' started by criticalbass, Sep 5, 2013. He was throwing this away. It was his dad's, who had been deceased a long time, and Danny didn't know what it was. Being a packrat, I grabbed it. 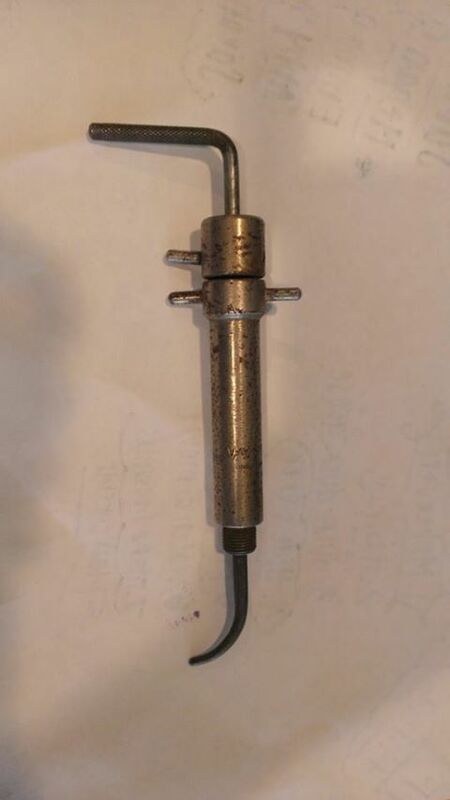 It's a well made tool, appears to be a factory product. The "barrel" is solid steel with a hole through the middle to allow the "probe?" to go back and forth. The curve at the end of the probe prevents its removal. There are threads at the bottom of the barrel. Barrel is approximately 3/4" in diameter, and I estimate overall tool length at 8 inches. My wife's niece got married 15 years ago, and friends threw a tool shower for the groom. I gave him a bunch of cheap tools to loan to others, and also gave him this. The note said something like "I have had this many years, and I hope it gives you as much pleasure as it has given me." He called me after the honeymoon and told me he had shown it to all his friends (and he has lots of friends). "What the hell is it?!" were his first words when I picked up the phone. We still don't know. Danny's dad was early into Mazda rotary cars, but Danny said he didn't think it was Mazda related, and he would know. I think it used to be chrome plated. So, what is it? All I have left is a picture. Nephew still has the tool in Dallas. Is the threaded portion compatible with standard spark plug threads? What does the writing say on the side of it? Don't forget the antifreeze......about 10qts, Prestone.............make that Quaker State. That's for artificially insemenating jackalopes! Or some type of top dead center indicator or a wierd timing tool for a rotory motor???? ?